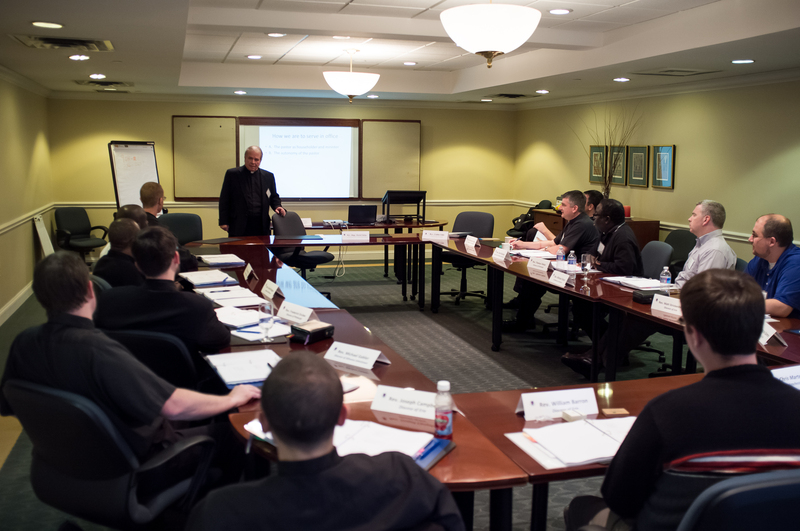 St. Mary’s Center for Continuing Formation offers and hosts a variety of continuing formation programs for priests in the spirit of the Bishops’ new Basic Plan for the Ongoing Formation of Priests. A private guest room with bath and all amenities, including private phone and computers for e-mail and the Internet. A state-of-the-art conference facility with conference rooms, library, private oratory and chapel, dining room, outdoor terrace, and fitness center. Sabbaticals continue to be important, even necessary, for the continuing formation of priests. Sabbaticals provide a time and some space for relaxing from the humdrum, for reflecting on life and ministry, and for reorienting oneself within the intellectual, personal and spiritual life of Christian communion. Click here for additional information on sabbaticals. Men ordained in 2019 and 2020 have been invited to return to St. Mary’s, to renew friendships and share pastoral experiences, and to respond to three questions: (a) What has given you joy in ministry? (b) What has blindsided you? (c) How does St. Mary’s share in the responsibility for your being blindsided? Alumni are invited back to St. Mary’s overnight to spend time with classmates and schoolmates to reflect on their work in pastoral ministry. There is no cost to attend. Check site frequently for additional information. A conference for newly minted pastors or for priests who will soon be appointed to the pastorate. Parish Life Coordinators are also invited to attend. Please click here for more information and to download a registration form. This year’s topic is Discipleship in Luke-Acts: In the Word and by the Spirit. Directed by Tom Hurst, PSS, whose experience as seminary rector, as professor of scripture and as presenter of retreats for bishops and priests is extensive. Click here to download a registration form. A conference addressing basic issues and required skills for priests and lay ecclesial ministers who are asked to become spiritual directors. Please click here for more information and to download a registration form. A two-day conference on the financial, physical, psychological and spiritual issues to be confronted, as well as on discovering the ways that God has written with crooked lines in the narratives of our lives. Download a registration form by clicking here. A Long Look at the Long Haul A spiritual retreat for priests 65 and older. Director: Tim Brown, SJ. Please click here for more information and to download a registration form. Rather than offering a one-size-fits-all package for presbyteral meetings, the Center offers to presbyteral leadership the possibility of designing specific programs to fit a diocese’s needs. The Center will work with diocesan directors and their commissions, construct and design a needs-particularized program, propose presenters to the diocese for its approval, and then contract with these presenters. Toolbox conference for directors of evangelization and vicars for clergy addressing some of the topics to be considered in the October Synod of Bishops. More information to come.